Note: The pack was archived with the latest version of WinRAR (v5.30). If you have trouble with unzipping please download from here this version! This is a powerful extensions with amazing customer support. Support tickets are dealt with quickly and efficiently. The extensions have a good documentation and are straightforward to install and configure. Installation and setup was easy and trouble-free. The modules looks fantastic and have a lots of options to customize to your taste. I definitely recommend these modules to anyone wanting to impress visitors on their Joomla website. For me and my work this package is a "must buy". Should mention that comes with an amazing support. Thanks MagicPoint for this products and services. This modules are fantastic. Easy to configure, well documented and the support is amazing. Quality coding and service, who could ask for more? Excellent products and services. Good work Magic Point. Thank you for your quick response to pre-and -after sales questions. I appreciate it. All modules are wonderful and the price is more than acceptable. A friend told me about you guys, and how much you respect your customers. You managed to convince me. You say that this package is amazing, i say it is brilliant. Thank you for opportunity to buy beautiful modules, at a low price! Very fast and great support! Nice pack and congratulations for this great support! For a web designer, this pack is a treasure, without limits on Installing modules on several sites and a more than acceptable price. Very good modules, but they're kind of expensive, so too painful like a bullet!!! 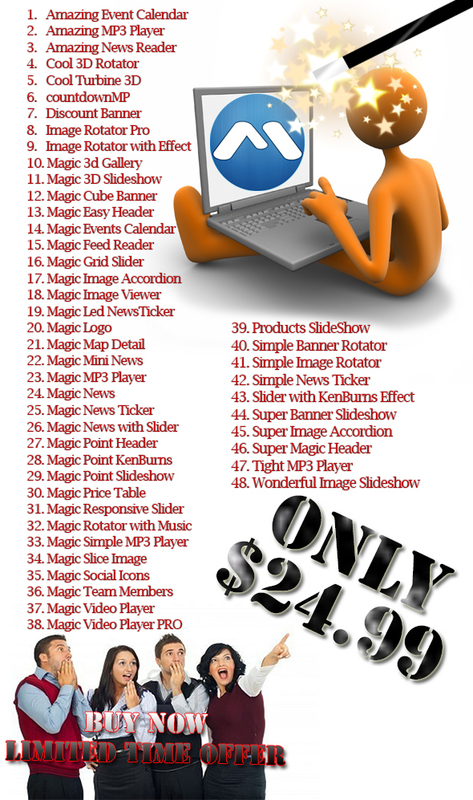 Click the button below to add the Amazing Offer Pack J1.6, J1.7, J2.5 & J3.X to your wish list.